This Bluetooth portable audio device is not just a Bluetooth speaker, but a combo device designed to take your audio/visual adventures anywhere you go. The Music Flow P7 is a compact, portable device designed with Bluetooth portability for unhinged sound experience in your palms. It comes in 3 Colors finish – White, Silver and Black with speaker grilles in the front and rear. With a Powerful sound output, the LG Auto Sound Engine and two passive radiators provide full-range sound and clarity at any volume. The portable and rechargeable device can be easily paired with other Music Flow (Bluetooth Speaker) devices, as well as your smartphone, thanks to the Dual Play function. 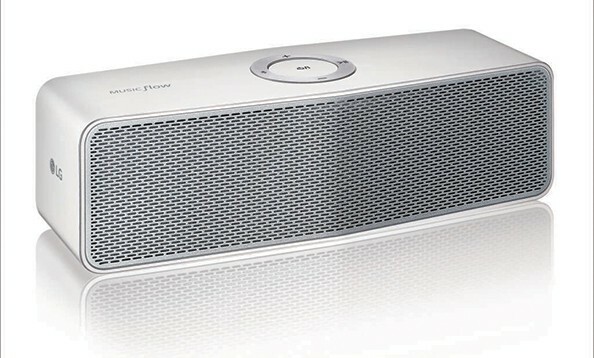 The speaker also enables pairing up to an LG TV for better sound using the TV Sound Sync feature. Multi Point function enables it to connect with up to three Bluetooth devices at the same time. Ensuring non-stop music on the go for 9 hours, the Music Flow P7 comes with a powerful 2660mAh battery and micro USB adapter for easy on-the-go recharge. The exquisitely designed portable speaker features a metal circular control pad for easy operations like skip a track, establish a Bluetooth connection, adjust the volume or switch on/off the speaker itself. A Special Mobile Application can be downloaded from Play Store to enhance the Experience of P7. The portable speaker is priced at Rs. 11,990.